1 of 3 Coat slow cooker bowl with nonstick cooking spray. Place chicken breasts in a single layer in bottom; combine hot sauce with 2/3 cup water; pour over chicken. 2 of 3 Cover and cook on HIGH for 6 hours or LOW for 8 hours. Remove chicken to a plate and shred with two forks. Return to slow cooker and stir to coat with sauce. 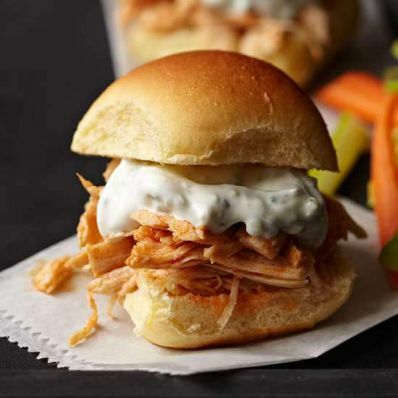 3 of 3 To serve, place shredded chicken on bottom halves of rolls and top each with 1 tablespoon of dressing. If desired, serve with celery sticks, carrot sticks and additional hot sauce. Per Serving: 1 g sat. fat, 7 g Fat, total, 49 mg chol., 792 mg sodium, 34 g carb., 294 kcal cal., 23 g pro.